Letters by Taylor Esposito, Dave Lanphear, Nicole McDonnell, Wilson Ramos Jr.
Is it just me or does it seem like everything is getting a makeover or a reboot these days? I know the winds of change are always blowing but sometimes it feels like everything is the same, though perhaps just slightly different. Take the legendary Sherlock Holmes, for instance. New movies, a couple of ongoing television programs, and several different comics. Some are modern, some are not. Every one of them is ever so slightly different in the concept, few are spectacular. None of them, however, are as far off the beaten path as Watson And Holmes. This particular incarnation features two men, both African-American, with a distinct sense of civic duty. We still have Holmes as a private investigator with uncanny deduction skills but this time he’s a bit more action oriented. His well-known and steadfast companion is still in the medical field but this time he’s an intern and far more athletic than in versions past. The setting is very urban, gang activity is a way of life and death is commonplace. A place where the innocent and the guilt live side by side and the line between them is blurred. And even though the status quo is so disheartening, the locals are terrified of what might happen were they to become involved in anything. 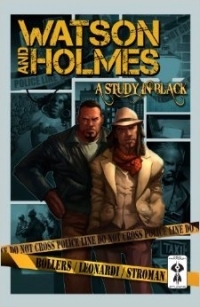 Tags: Archie Van Buren, Brandon Perlow, Comixology, Dave Lanphear, GuruFX, Jay David Ramos, Karl Bollers, Larry Stroman, New Paradigm Studios, Nicole McDonnell, Paul Mendoza, Rick Leonardi, Sherlock Holmes, Taylor Esposito, Watson And Holmes, Wilson Ramos Jr.